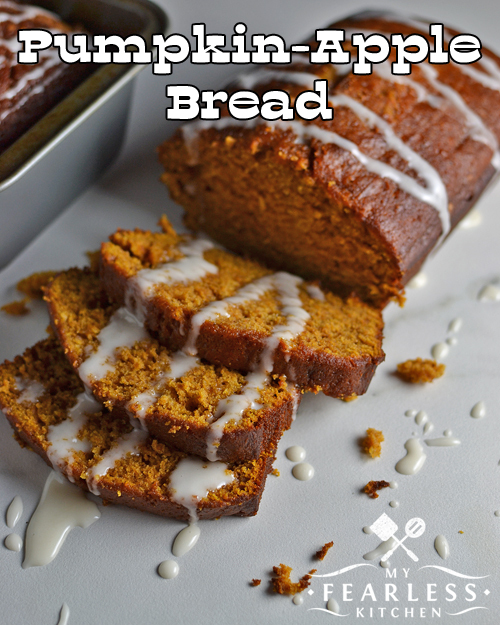 This Pumpkin-Apple Bread has all the fun flavors of fall, and the icing gives it a perfect hint of sweetness. Eat it like bread or like cake and enjoy! 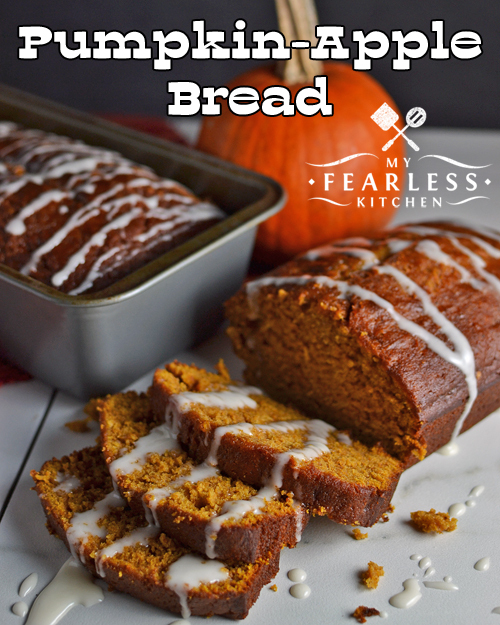 If you like quick breads, and you like pumpkin, you will love this bread. This recipe makes two loaves of bread, and it’s a good thing because I can’t stop eating it! When I have it available, I love to cook with fresh pumpkin instead of canned. When I run out of fresh frozen pumpkin, I turn straight to canned pumpkin without a problem. I enjoy cooking as much “from scratch” as I can, but I also do not have a problem with the convenience or nutrition of canned or frozen foods! You can use any variety of pumpkin to cook with, but some are better than others. Pie pumpkins tend to be smaller and sweeter (you can often find those in the produce section at the grocery store in the fall). Jack-o-lantern pumpkins (or carving pumpkins) are bigger, but the flesh of the pumpkin is thinner, so you won’t get quite as much pumpkin for your effort. Check out this post for tips on cooking pumpkin. In an electric mixer, using the regular attachment, beat sugar, brown sugar, oil, and melted butter on medium speed until creamy. Add eggs, one at a time, mixing to combine before adding the next egg. In a large bowl, mix flour, baking soda, and spices. Add ½ of the flour mixture to the sugar mixture in the electric mixer. Mix on low until flour is incorporated. Add ½ cup water and the rest of the flour mixture. Mix well on low speed until flour is incorporated. Add ½ cup apple cider and pumpkin. Mix well. Pour batter into 2 greased 9x5 loaf pans. Bake at 350 degrees for 55-60 minutes, until toothpick inserted in center of bread comes out clean. Let cool in pans for 5-10 minutes, then turn out on wire racks to cool completely. In a bowl, combine powdered sugar, vanilla, and 2 Tablespoons milk. Mix together with a spoon. Add more milk, a tablespoon at a time, until desired consistency is reached. 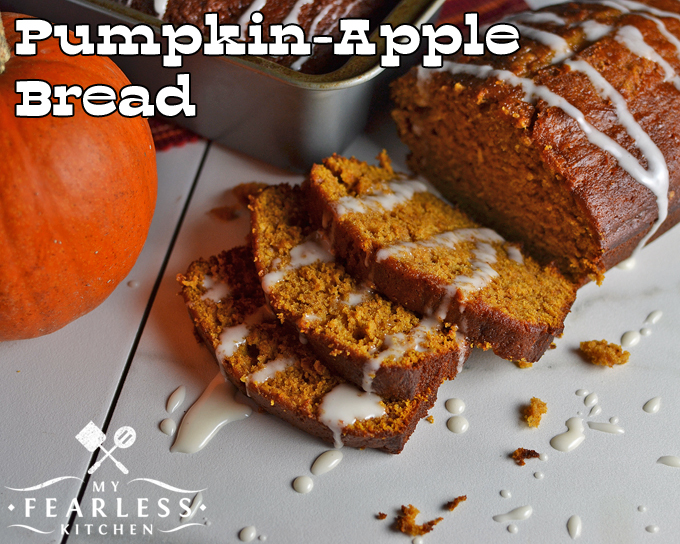 You might have just hit the fall food holy grail – pumpkin and apple together in one great dish! Thanks for sharing on the Celebrate 365 All Things Apple Blog Party! That looks like a tasty loaf of fall, I’m ready for a slice! One of our fall favorites, for sure!